The 80D looks extremely similar to the previous model (70D) but look inside and there have been some significant upgrades. The 80D features an all new 24MP "DualPixel CMOS AF" sensor - the sensor not only captures the image, it also acts as part of the autofocus system. This significantly improves autofocus capability when using the camera in Live View mode (using the LCD screen as the viewfinder). It is still not as fast as normal viewfinder operation, but the gap is closing. The autofocus system is also upgraded - the 80D uses 45 focuspoints compared to the 19 points in the 70D. The most significant update for dental use is the two Custom Modes (C1 and C2). This allows us to pre-program the 80D so that C1 is set for portrait views and C2 is set for all of the closeup views. Simply choose the custom mode for the view(s) you are taking and focus and shoot. The Custom Modes are also nice in case someone changes settings on the camera. To get back to the proper settings, you simply turn the dial to another mode and then back to the User Mode - all of the pre-programmed settings are then restored. Built-in Wi-Fi is a very nice addition to the 80D but it doesn't work the way that most dental offices would like. You can use your smartphone, tablet or computer to view images on the camera's memory card and you can also control the camera using one of these devices as a live view remote. You can also transfer images once they have been captured on the memory card, but the camera will not automatically transfer the images to a device. Nissin's MF18 macro flash is the first of five flash options for E-TTL flash control on the 80D. The MF18 is very similar to the Canon MR-14EX macro flash in that it is also a dual tube flash that is shaped like a ring. Each side of the flash has two possible positions: in next to the lens or each side can expand slightly out to the side. The third option is the Metz MS-1 wireless macro flash. The Rebel T7i and 77D are the latest Rebel models that have a built-in wireless speedlight controller. To use the Rebel T7i or 77D with the Metz MS-1, you simply pop-up the built-in flash and camera controls the flash output for a proper exposure every time. This combination is lighter and more balanced than the other two flashes as there is no power pack on top of the camera or a cable from the camera to the flash. 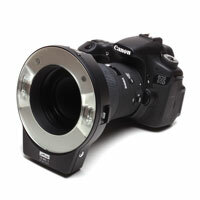 The fourth option is the Canon EL-100 Wireless Macro System with R2-U Bracket (shown below). The package includes two Canon EL-100 flashes and the R2 bracket. The 80D's built-in wireless flash transmitter which controls the Canon flashes for a perfect exposure. 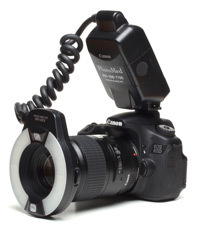 The fifth option is the Nissin i40 Wireless Macro System with R2-U Bracket. The package includes two Nissin i40 flashes and the R2 bracket. The built-in wireless flash transmitter controls the Nissin flashes for a perfect exposure. There are four lens options for the T7i: the Tokina 100mm macro lens (18oz. ), the Canon EF-S 60mm macro lens (11.5oz. ), the Canon EF 100mm macro lens (20.5oz.) and the Canon EF 100mm L macro lens (22oz.). All four lenses offer very similar optical quality while the Canon EF 100mm L macro lens adds Canon's Image Stabilization (IS) system. The IS system makes focusing easier - a sophisticated system measures movement and counteracts the movement by shifting lens elements. If you are taking a mirror shot and you have the mirror in one hand and the camera in the other, you will be amazed how much more stable the image is in the viewfinder. For all other dental practices, a 100mm or 105mm macro lens is recommended to allow shooting smaller fields, especially in the posterior. These lenses have enough working distance to allow 1:1 closeup magnifications anywhere in the mouth. If you have any questions about which lens is best for your needs, please call us. Accessories are too numerous to list here. 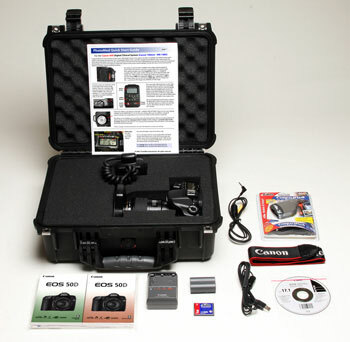 PhotoMed carries everything you might need for your 80D: memory cards, memory card readers, recreational lenses, etc. Give us a call and we'll help you decide which accessories will work best for you. There are four lens and five flash choices for our Canon 80D Systems - use the grid below to determine the price of your system. Please call or email us if you have any questions regarding lens and flash configuration. *#1 - This option is not recommended as the Tokina lens extends in/out as it is focused making it more difficult to use with the R2 bracket. *#2 - This option is not recommended as the working distance with the Canon 60mm is shorter than the other lenses making it more difficult to use with the R2 bracket. *#3 - This option is not recommended as the working distance with the Canon 60mm is shorter than the other lenses making it more difficult to use with the Metz flash. Listed below are popular accessories for the Canon 80D. Please call or email us if you have any questions regarding options or accessories.